Louise Berliawsky Nevelson, a Russian born American artist, was born on September 23, 1899 in Kiev, Russia. 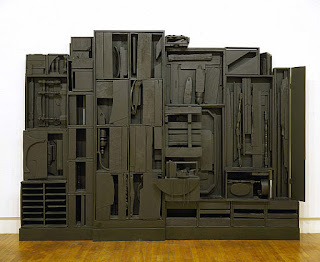 Nevelson is known for her abstract expressionist “crates” grouped together to form a new creation. She used found objects or everyday discarded things in her “assemblages” or assemblies, one of which was three stories high. “When you put together things that other people have thrown out, you’re really bringing them to life – a spiritual life that surpasses the life for which they were originally created,” remarked Nevelson. Louise married Charles Nevelson after she graduated from high school in 1918, and together they had a child named Myron Nevelson. Louise and Charles later separated in 1931. Nevelson died on April 17, 1988 in New York, New York.